This week i ♥ faces is doing something a bit different. This week they are asking you to submit your very best face photograph for a chance to be selected for the i ♥ faces Blurb book! I am entering the amateur category since I've only had my camera for 6 weeks and am still learning the ropes of photography. I am entering this photo because I love the warm glow and the beautiful catchlights in the eyes. Isn't that the focus of a face anyway? It's all about the eyes and I think this photo captures them beautifully! I'm also loving the golden highlights in her hair and her rosy pink lips. I know the competition will be stiff! To enter your face photo or to see more gorgeous entries visit i ♥ faces! 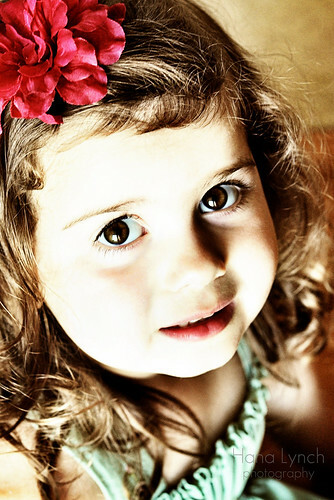 That is such a beautiful picture...the flower in her hair is so pretty and such pretty eyes. Yet another amazing photo, Hannah! I love the natural lighting and the angle from which you took the photo! Beautiful job as always! I really love this picture. It is captivating! She has such pretty brown eyes! Lovely! I absolutely love this photo!!! Beautiful! Amazing photo. She Is adorable. Oh, she is beautiful and the light only serves to enhance that beauty! What a beautiful photo and a sweet little face!!! Good luck! What a beautiful capture.It's just breathtaking! Love the editing. good job! Love the coloring and lighting. Fantastic shot! I cannot believe you're an amateur :-) what talent you have! I love this entry so so much! This is a stunning photo. Only been taking photos for a short time? You have a gift. Beautiful! Enjoy your new camera! Mine is in the shop! I blew it up! lol I miss it! Thanks for stopping by my blog! I want to follow yours! YAY! That is a gorgeous shot! She is a doll! Thanks for commenting on mine. It was a tough choice! Great picture! The coloring is beautiful! Her eyes look like cartoon eyes too! This is one of my favorites for sure! Great job!! She is gorgeous. Those eyes kill me. I'd pick you for the book hands down! Ooooh the song brown eyed girl comes in my head when I see this photo. Love it and good luck in the contest! Thanks for visiting! Great shot! She looks so grown up! She is a princess! What a lovely photo! LOVE your photograph! very very precious!